Fishy Fishy is a relaxed, informal seafood brasserie in Brighton that was the brainchild of three close friends: James Ginzler, Dermot O'Leary and Paul Shovlin. They share a passion for good food, but more importantly food that has been locally sourced and is in season. They work closely with suppliers to make sure the fish they serve is caught in the least wasteful way which can mean line-caught fish, pot-caught seafood or fish caught in gill nets with big holes in them so they only catch the larger fish and let the small ones through. They only serve fish and seafood when it is in season - that is why there's no cod on the menu in the summer or lobster in the winter. All their passion and expertise is contained in this lovely new cookbook which has over 90 recipes, as well as fascinating fish facts and plenty of advice on how to prepare and cook fish. With chapters on Starters, Barbecue & Alfresco Eating, Everyday Fish & Shellfish, Special Occasions, Sauces, Side Dishes & Desserts, there is plenty of inspiration for cooks of all levels. More than just a restaurant cookbook, this is a wonderful collection of recipes as well as a timely look at the ways we should be sourcing and eating fish. The Foreword to the book is writen by Dermot O'Leary, radio and TV presenter, best known as the X Factor frontman. He lives in London and along with friends James and Paul is passionate about fish and seafood. Opening a restaurant was a long-held dream that has finally come to fruition and Fishy Fishy now has an established following and is regularly booked up in advance. They have just opened a second restaurant in Poole. This is their first book.
. . . and you must try the mushy peas? The next chapters deal with fish recipes which at first glance assume that you have knowledge of trimmings and salads, etc but don't be put off these are all explained at the back of the book with a whole section on sauces, side dishes and desserts. Quick glances through the book will I am sure impress and you will certainly find something to appeal to even the fussiest of appetites. My favourite was the Skate wings which is a great favourite. Most recipes have full colour photographs and as such make the whole experience even more mouth-watering. This is definitely a book for me - as well as a lot of the recipes in the book. This is a beautifully presented book, with gorgeous photography of the finished dishes. The recipes are mostly the sort of meals you would cook on a day to day basis, with a final chapter on more elaborate, dinner party style recipes. 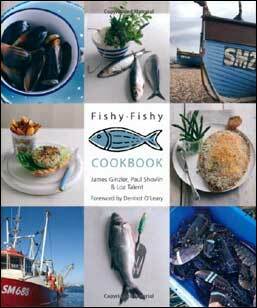 If you want a really useful reference book which covers lots of different types of fish, then this is the book for you. Overall, this is a great seafood cookbook. 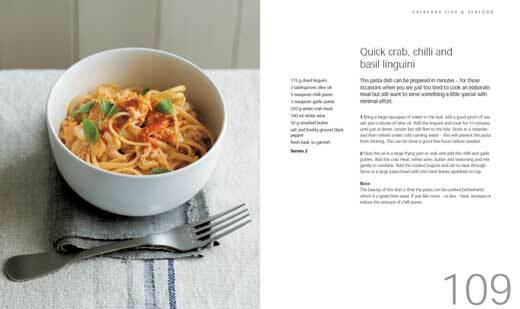 The seafood and other ingredients for each recipe can be easily sourced from any decent supermarket and/or fishmonger and are limited, in most recipes, to less than 10 ingredients, which not only allows for most of these dishes to be whipped up relatively quickly, but also, more importantly, lets the seafood be the star. The recipes are simple, appetizing and unpretentious. Most people who have any interest in cooking whatsoever could find the majority of ingredients in their store cupboards and freezers. Inexperienced cooks will find the hints and tips very useful, such as cooking a pastry pie lid separately to avoid the filling boiling up and making the underside soggy. Many recipes come with numerous variations so a technique, once learned, can be used over and over again without boredom setting in. Examples include 3 ways with mussels (Marinere, Thai, Provencal) and eggs (Benedict, Florentine and Royale). There are a sprinkling of non-fish dishes, including a goat's cheese tartlet and a variety of scrumptious desserts, and I particularly enjoyed the interesting snippets scattered throughout the book. For example, did you know that clam chowder has been served at every US president's inauguration since 1981? 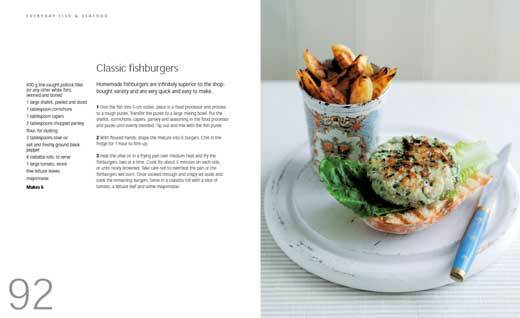 Homemade fish burgers are infinitely superior to the shop bought variety and are very quick and easy to make. Dice the fish into 5-cm cubes, place in a food processor and process to a rough purée. Transfer the purée to a large mixing bowl. Put the shallot, cornichons, capers, parsley and seasoning in the food processor and purée until evenly blended. Tip out and mix with the fish purée. With floured hands, shape the mixture into 6 burgers. Chill in the fridge for 1 hour to firm up. 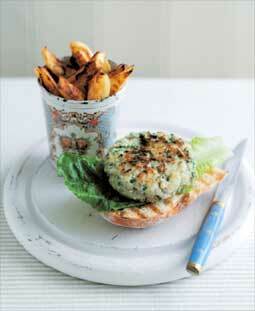 Heat the olive oil in a frying pan over medium heat and fry the fishburgers, two at a time. Cook for about 5 minutes on each side, or until nicely browned. Take care not to overheat the pan or the fishburgers will burn. Once cooked through and crispy set aside and cook the remaining burgers. Serve in a ciabatta roll with a slice of tomato, a lettuce leaf and some mayonnaise. This pasta dish can be prepared in minutes  for those occasions when you are just too tired to cook an elaborate meal but still want to serve something a little special with minimal effort. Bring a large saucepan of water to the boil, add a good pinch of sea salt and a drizzle of olive oil. Add the linguini and cook for 10 minutes until just al dente, tender but still firm to the bite. Drain in a colander and then refresh under cold running water  this will prevent the pasta from sticking. This can be done a good few hours before needed. Heat the oil in a large frying pan or wok and add the chilli and garlic purées. Add the crab meat, white wine, butter and seasoning and mix gently to combine. Add the cooked linguini and stir to heat through. Serve in a large pasta bowl with torn basil leaves sprinkled on top. 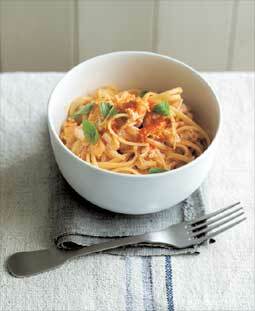 The beauty of this dish is that the pasta can be cooked beforehand, which is a great time-saver. If you like more  or less  heat, increase or reduce the amount of chilli purée. This Japanese dish is a must for oyster lovers. 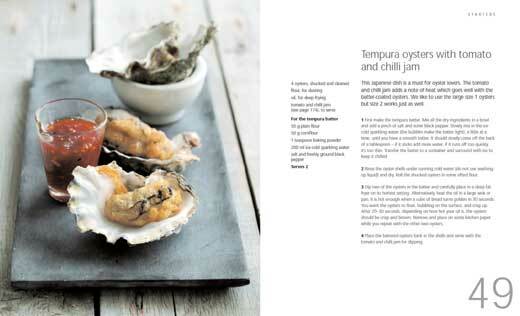 The tomato and chilli jam adds a note of heat which goes well with the batter-coated oysters. We like to use the large size 1 oysters but size 2 works just as well. First make the tempura batter. Mix all the dry ingredients in a bowl and add a pinch of salt and some black pepper. Slowly mix in the icecold sparkling water (the bubbles make the batter light), a little at a time, until you have a smooth batter. It should slowly come off the back of a tablespoon  if it sticks add more water, if it runs off too quickly its too thin. Transfer the batter to a container and surround with ice to keep it chilled. Rinse the oyster shells under running cold water (do not use washingup liquid) and dry. Roll the shucked oysters in some sifted flour. Dip two of the oysters in the batter and carefully place in a deep-fat fryer on its hottest setting. Alternatively, heat the oil in a large wok or pan. It is hot enough when a cube of bread turns golden in 30 seconds. You want the oysters to float, bubbling on the surface, and crisp up. After 20  30 seconds, depending on how hot your oil is, the oysters should be crisp and brown. Remove and place on some kitchen paper while you repeat with the other two oysters. 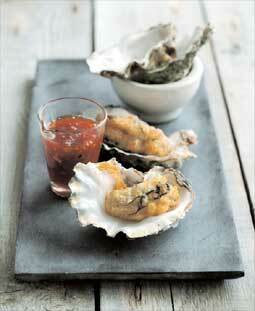 Place the battered oysters back in the shells and serve with the tomato and chilli jam for dipping.